My name is Claire; I have my little boy Samuel and my little girl Grace, we live in Rotherham. Samuel had just had his 2nd birthday when he fell out of bed and got a large bruise on his face that didn’t disappear. On the 15th of May 2008 while I was washing Sam’s hair he started screaming in pain and spiked a very high temperature. I took him to Rotherham Hospital who initially started treatment for Meningitis as he had developed a rash all over his body. The following day when Sam’s blood results came back the doctor and nurse sat me down and explained that there was a problem and that Sam’s blood levels were very low and it is possibly a sign of Leukaemia. I felt physically sick and couldn’t really believe or understand what they had just told me. I called Samuel’s dad Stephen who came straight up to the hospital. We were both devastated. That same afternoon we were transferred by ambulance to Sheffield Children’s Hospital onto ward M3. The following morning Samuel was taken to theatre to have a bone marrow sample taken to check for Leukaemia cells. That afternoon we were taken into a room, told to sit down and were told our little boy had Acute Lymphoblastic Leukaemia. Our world fell apart. A couple of days after diagnosis we were introduced to PACT. Beryl was really supportive and understood how we were all feeling. From that day until now PACT has been there for our family providing emotional support and a shoulder to cry on when needed. It became a weekly occurrence having to shout Beryl on clinic days to help carry Sam into the blood room and to talk Sam round when he was laying on floor in the corridor when he didn’t want his treatment. For some reason Beryl was the only person Sam would listen too. PACT provide trips for the children from M3 and their families every year the ones we have been on are Pets Corner, Alton Towers, Drayton Manor and Flamingo Land. The trips are brilliant, it is so nice seeing everyone outside hospital and having fun. Sam also attended the FIT FOR FUN with Rotherham United and Children In Need. This helped Sam build confidence whist still on treatment. Another amazing event organised by PACT is the PACT Christmas Party. All the children look forward to this event as it is full of fun, party games, dancing and they get to meet Father Christmas!! We have never needed to stay at PACT house as we don’t live very far away from hospital, but for those that do live far away it provides them with a lovely home close to hospital. We have stayed at the 2 holiday homes provided by PACT one in Filey and more recently in Berwick Upon Tweed they are so nice and provided a much needed break. Samuel has just finished his 3 year chemotherapy treatment but is still been closely monitored. After a very tough 3 years of hospital visits and treatment he is now making excellent progress and I know PACT will continue to be there for us whenever needed. They are an amazing charity and I know many families would not have coped half as well without the support they provide for the whole family. 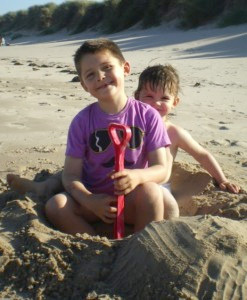 The photo shows Sam and Grace on our recent holiday to the PACT caravan at Berwick after Sam’s treatment had finished.